Hi friends! 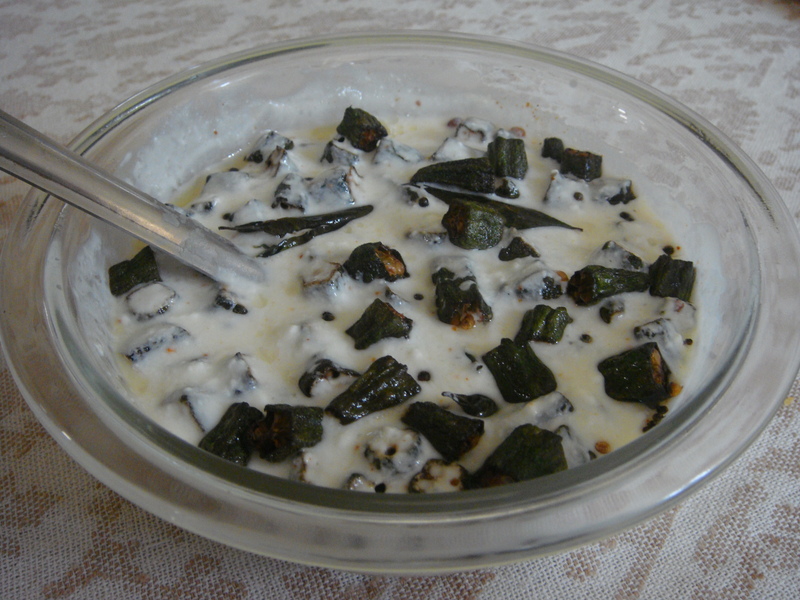 Here is a simple,delicious and very healthy recipe of an Indian side dish of yogurt containing fried Bhindi / okra/ lady fingerpieces and spices. Wash very well Bhindi/ okra /lady finger. Dry on a paper kitchen towel, trim both the ends, cut into slightly thickl circular discs. Keep aside. Take a wok / kadahi and add oil to it, heat oil , put chopped Bhindi /Lady finger/Okra gently in the hot oil and fry it on medium-high heat. When well fried, drain on a paper kitchen towel and keep aside. Take curd / yogurt in a medium sized bowl. Whisk the curd / yogurt with a blender or fork until it is smooth. Add water if curd / yogurt is too thick and blend well. Add fresh coriander pate, cumin powder, pepper powder, salt, red chili powder to the whisked curd, mix it well. Now, in the spiced curd / yogurt and gently fold in the fried Bhindi / Okra /Lady finger. Heat a table spoon oil in a small pan, add mustard seeds and when mustard seeds start spluttering add curry leaves, saute for few seconds then turn off the heat and porethis seasoning evenly on the fried Bhindi / Okra /Lady finger raita. Refrigerate the raita. Serve cold with boiled rice, rice biriyanis etc. The dietary fibers contained in this vegetable are best for those who are on weight reduction programme. 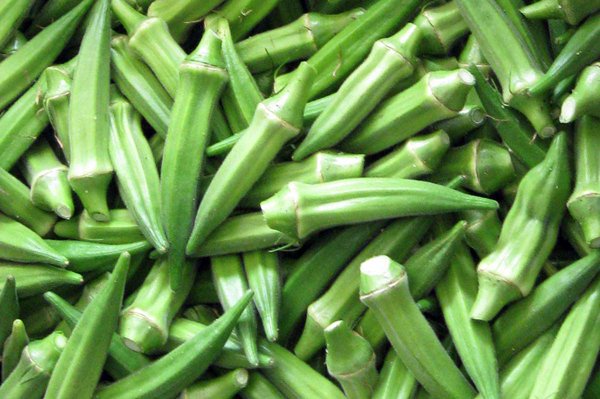 Bhindi / Okra /Lady finger comprises of no calories, therefore is good for weight loss. The high Vitamin content in Bhindi / Okra/ Lady finger helps battle cold and improves the overall functioning of the immune system. The Vitamins and numerous minerals like magnesium, manganese, calcium and iron in Bhindi / Okra/ Lady finger fights against hurtful free radicals and enhances the functionality of the immune system. Never before I have prepared okra raita but it appears to be so tempting that I tried and my God its so wonderful!